In this scene of daily life in 1890, a burro trudges down a dirt street in a New Mexico town carrying a load of firewood. It is followed by a man in a hat. 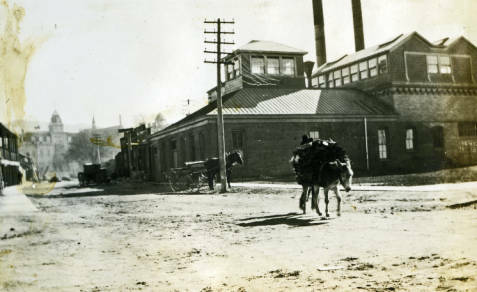 Behind them a horse and cart wait by a telephone pole, in front of a large brick building. Image Source: "Burro with firewood load." (000-885(5)-0006); digital images, "Nancy Tucker Pictorial Collections of Southwest Materials," Center for Southwest Research, University Libraries, University of New Mexico, New Mexico Digital Collections (http://econtent.unm.edu/cdm/singleitem/collection/tucker/id/85).